BSEF members – Albemarle, Chemtura and ICL Group – will participate in the largest international trade fair for plastics and rubber taking place from 19 to 26 October in Dusseldorf, Germany. The companies will showcase their innovative bromine based solutions and their increasingly sustainable product portfolio. During the 8-day trade fair, you can meet Albemarle team at Stand 6D61, Chemtura at stand E24 and ICL Group at stand 8D44. 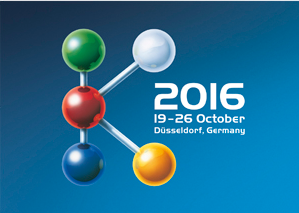 With more than 3000 exhibitors and over 218,000 trade visitors, K 2016 is, from far, the preferred place for industry to present its latest technical developments, procedures, and techniques, and future trends. Side conferences, forum discussion and networking events offer K Show visitors and exhibitors a unique opportunity for business partnership and knowledge sharing. Great Lakes Solutions, a Chemtura business, is “excited to participate at the K show this year”. “The business continues to invest in sustainable flame retardant technologies such as Emerald Innovation® 3000 for styrenic insulation foams”, they concluded. Great Lakes Solutions have recently opened a global center of excellence dedicated to flame retardant research and development at Naugatuck, Connecticut, USA. Their brominated flame retardant portfolio now comprises 90 % by volume of polymeric or reactive molecules, which they see as the future. BSEF is the international bromine production organisation. Since 1997, the organisation has been working to foster knowledge on the uses and benefits of bromine-based solutions. BSEF strongly believe in science and innovation. Through investments in research and development BSEF members create robust bromine-based technologies meeting the needs of society. The members of BSEF are Albemarle Corporation, ICL Industrial Products, Chemtura and Tosoh Corporation.